Most of us will see a change in our financial situation in retirement. Instead of earning an income from work, we will start receiving income from other sources such as Social Security, pensions and/or annuities, and possibly withdrawals from our retirement savings accounts. Since our income sources will change in retirement, in what ways if any should our tithing and giving change if any? There are different views on this subject, and since I have not given it much thought, I wanted to take a closer look. But first I want to provide a brief overview of tithing as I understand it. I will then construct a working definition to use in the rest of the article. Tithing is still for today. It is a Biblical mandate, or at a minimum, an important Biblical principle that all Christians should follow. Tithing, which is defined as giving ten percent of your first fruits (which in our day most interpret to mean “income”, either gross or net), is a Biblical mandate, or at least an essential Biblical principle, that was instituted in the Old Testament (OT) and never repudiated in the New Testament (NT). Therefore all believers are expected to tithe as a nominal part of the Christian life. (Gen.4:3-5; 14:18-20; Malachi 3:10; 5:16-29; 23:23; Luke 11:42). The first is probably the most common, at least in Evangelical circles, but the second is surprisingly common as well. Most believers will find themselves more aligned with one or the other. Others will be somewhere in between. I am not going to debate the finer points of these two positions. But I can say that there are aspects of both that I would agree with. For example, I can’t find any verses in the NT that explicitly cancel the tithe; in fact, some can be interpreted to mean that it is still in effect. And although we are under the New Covenant of grace, tithing could at least be considered a very useful principle for developing the spiritual discipline of giving. Further, although I don’t think we have a “legal” obligation to tithe, the Bible seems to teach that God expects all true believers to give from a heart of gratitude and generosity, which is consistent with the teachings of Jesus and the Apostles in the NT. My approach in this article will be to use a working definition of the term “tithe” to refer to, “the spiritual discipline of consistent, proportional giving of a percentage of our income that is motivated by heartfelt gratitude and generosity in keeping with the NT teachings.” Based on that definition, giving at the ten percent level may be aspirational for some, whereas others will be willing and able to give much more. Many sincere believers who mostly align themselves with perspective number (1) above would say that they do not necessarily need to “tithe” on money they have already “tithed on.” They may also take a more “formulaic” approach to calculating the tithe. However, those who are more aligned with number (2) would not be as likely to make such a distinction, and they may decide their level of giving based on how the Holy Spirit leads them. When it comes to Social Security, there are two different scenarios to consider: those who are self-employed and those who work for an employer. You are self-employed. If you are self-employed and have tithed on your gross income for your entire working life, and have also contributed the full amount to Social Security (which you paid as a FICA tax), you paid both the employee and matching employer portions. In 2017, that amounts to 12.4% (6.2% for each) up to a maximum of $15,773. When you retire, you expect to receive regular payments. However, you are not receiving “your money” back per se’ as though it was in an investment account with your name on it. Social Security is a trust fund that operates more like an insurance annuity. If you die young, you may not realize the full benefit of your contributions. If you live a long life, you could receive much more than what you put in. If you have consistently tithed on your gross income (i.e., before taxes and deductions), you have already tithed on the amount you contributed to Social Security over your lifetime. So, strictly speaking, you could say that you do not “owe” a tithe on your Social Security benefits, at least up to the point where you have received as much as you have put in. However, you would still “owe” a tithe on anything you receive after that. You are an employee. If you are employed by a company that you don’t own and tithed on your gross income, you would have contributed only HALF the money that went into the Social Security “trust” system because your employer had to pay the other half for you. That benefit is not included in your gross income, so it’s highly unlikely that you tithed on it. On that basis, it could be argued that you should tithe on HALF of your Social Security income, which is the employer contribution that you did NOT tithe on already. Then, just as with the self-employed person, once you receive back everything you had contributed (and tithed on), you would need to tithe on the full amount going forward. A caveat to both of the above scenarios would be if you tithed on your net income (i.e., after taxes, including Social Security, Medicare, etc.) all your life. In that case, you should tithe on ALL your Social Security income since you did not tithe on it in the first place. In addition to Social Security, you may also have income from a pension, annuity, or withdrawals from retirement accounts such as 401/k, 403b, IRAs, SEPs, etc. Each of these is a little different. Pensions. Although they are increasingly rare, if you receive a pension, either as a lump sum or as a lifetime annuity, and did not contribute anything to it, then it should be treated as a new income stream in retirement that you have not tithed on. If you did make contributions to it, then it looks much like the “employee” Social Security scenario I discussed above; i.e., some of what you receive has been tithed-on, and some have not. Annuities. These are trickier. All annuities, regardless of type, are funded by either a lump sum payment (immediate annuity) or a series of payments over time (deferred annuity). Once you start receiving payments, it looks almost exactly like Social Security or a pension. If the money used to fund the annuity has already been tithed-on, you would only tithe on it once you have received back the full amount you paid. Typically, that “break-even” period will be much longer than with Social Security because the payouts are lower, especially in a low-interest environment like we have today. Retirement savings accounts. Many people contribute to a retirement account. For most, it’s either an IRA or SEP or a 401K/403b. These accounts differ in several respects, but most important to this discussion is that IRAs and SEPs are fully-funded by you whereas both you and your employer MAY fund a 401k/403b plan. An IRA looks much like an annuity in the sense that you contribute to it, it grows (hopefully), and then you take the money out in retirement. If you had tithed on your IRA contributions (regardless of whether they were before or after-tax contributions), you would not tithe until you had taken out all the pre-tithed-on contributions. For example, if you contributed $200,000 over your lifetime, and that has grown to $500,000 (“tax- and tithe-free”), and you withdraw 5 percent per year (or $25,000) to live on, it would take you 20 years to reach $200,000. 401/k and 403/b type accounts follow a similar pattern. Like IRAs, they can be either before- or after-tax. However, if you have always tithed on your gross income, then your contributions have been pre-tithed-on. The difference is that there is typically a matching employer contribution of some amount that is added but not included as income and therefore likely not tithed-on. As with an IRA, these combined contributions then grow depending on how you invested them. Once you start withdrawing from them, a similar dynamic is in play. For example, if you contributed 6 percent of your salary to your 401k amounting to $200,000, and your employer matched it 50 cents in the dollar up to 6 percent, they would have made an additional contribution of $100,000, for a total of $300,000. If that account has grown to $750,000, and you withdraw 5 percent per year (or $37,500), it would take only 5.3 years before you reach $200,000. You would then want to tithe on everything you withdraw in the years following. And like an IRA, the account may continue to grow, depending on you invested. Like Social Security, Medicare is an old-age insurance plan but specifically for medical expenses. You pay into it (in the form of tax withholding), and then you receive benefits after you retire. Because Medicare works much like a health insurance plan, the possibility that someone will receive far more in benefits than they paid in is VERY high. For example, according to my Social Security statement, I have contributed $76,302 to Medicare, and my employers have contributed $76,510. I could receive much more than $76,302 in benefits for just one major surgery! The major distinction between Medicare and the retirement income sources I listed above is that the government pays Medicare benefits directly and does not tax them as income. They go straight to the service providers to cover doctor and hospital bills. Most of us don’t feel obligated to pay tithe for any healthcare benefits we receive beyond our premiums before we retire, so there is no good reason to do it on Medicare benefits. If you were to ask, “hey, do I really need to crunch a bunch of numbers to decide what to give to the Lord?” my response would be, “no, you don’t.” But if you want to use that approach because it’s consistent with your convictions and what you’ve done in the past, then I say go for it, even though I think there is a better way. Some believers who want to honor the Lord by giving a tithe can get caught up in things like what exact percentage to give or whether the tithe is paid on gross or net income. However, as we mature in the faith, perhaps it should start to be more of a transition from percentages and calculations to a focus on the heart. Ultimately, we want to become cheerful givers where giving is done joyfully, worshipfully, generously, and consistently in response to all that God has done for us. If you mostly align with my perspective on tithing number (1) above, you could legitimately argue that any income you receive in retirement that you originally tithed on doesn’t need to be tithed-on again. But to be consistent, you should also tithe on any new income beyond what you initially tithed-on, regardless of whether it’s from Social Security or the other sources of retirement income I mentioned. If that is your position, I would have no problem with that. (But good luck with the math involved, although similar math is required when it comes to calculating taxes in retirement.) You can delay tithing (or giving) until you have reached your “break-even” point, but keep in mind that by doing so you also delay the joy and blessings of giving on a regular basis. Someone who is more aligned with perspective number (2) might have a different view. Such a person is probably not focused on a tithe, per se’ (unless they also have some tendencies toward number 1). 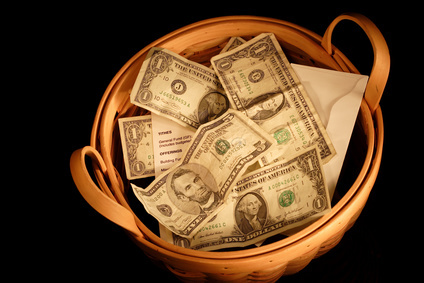 If you believe that tithing is a good Biblical principle and take more of a stewardship view, you will be less concerned about exact amounts of pre-tithed-on versus not-tithed-on income and focused instead on how you can manage your life and finances so that you can enjoy God’s blessings and provision while also being a generous giver over the course of your entire life. If you acknowledge that God is the owner and provider of all that we have, you may decide to tithe on your retirement income from the start, regardless of whether you’ve already tithed on it or not. Or, you may choose a middle-ground approach. In the end, it’s your convictions and conscience that matters most. In retirement, I will receive Social Security benefits and income from retirement savings. I could run some of the calculations that I described above, but I’d rather just keep things simple and keep giving as I have been. I have always given at least a tithe of 10 percent or more since I became a Christian plus offerings above that, and I see no reason to stop when I am retired. I will factor that into my retirement budget just as I’ve done in the past. Also, because I will be partially living off a retirement “nest egg” there may be times when I will have to “break a few eggs” to be more generous. Although I would like to leave a legacy for my family, I also want to be able to use the resources that God has given me to further his Kingdom and to bless others while I am still alive. Regardless of whether you adhere to tithing view number (1) or number (2), some variation of the two, or a totally different one, ask the Lord to “…make all grace abound to you, so that having all sufficiency in all things at all times, you may abound in every good work” (ICor.9:8 – ESV). Good works are an essential part of the Christian life. Good stewardship compels us to use whatever abundance God has given us to perform the good works that he has called us to do. That includes giving while in retirement up to the end of our lives.